Located on Skyline Boulevard not far west of Cornelius Pass Road is a new small farm business that’s unique in many ways. 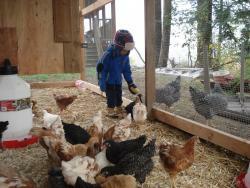 Phoenix’s Egg Farm is the only licensed egg farm in Multnomah County and one of very few which are truly free-range. Souriya and Sophin Khamvongsa along with their son Phoenix have invested a lot of time and energy to develop a successful small business producing a fresh and healthy product. The family moved to Skyline in 2007, their first time living in the country. The egg farm started in 2009 with a flock of only 20 chickens, which quickly grew to 50. Eggs were sold from a roadside stand at the end of their driveway on a weekly pickup schedule. Demand soon exceeded supply. The Khamvongsas developed a business plan for a larger operation, built hen houses and fences, and got the necessary permits and inspections, including inspection by the Oregon Department of Agriculture of their egg processing room, where eggs are collected, washed and refrigerated. They now have approximately 1,000 chickens in their flock. with more than a dozen breeds laying eggs of different shades and colors. Full production started in June 2010. The farm is currently producing an average of 55 dozen eggs per day, Souriya said. He expects peak production of about 65 dozen per day this summer, and plans for further expansion are underway. Neither Sophin nor Souriya has previous farming experience, but Souriya’s father and grandfather each had farms with 1,000 ducks. He also has cousins in Texas with commercial-scale poultry operations. The farm is named for their son Phoenix, born in the Chinese Year of the Rooster. The parents say he has a rooster-like personality and that he takes an active role in tending the flocks. Sophin manages the farm business and marketing relations, and Souriya also has a full-time job off the farm. They both spend long hours doing farm work: collecting and processing eggs every day, making deliveries four to five days per week, cleaning hen houses, etc. Daytime, chickens roam in large, fenced enclosures; they nest in open wooden boxes in the hen house at night, safe from predators. They are never in a cage. Free range allows chickens to pursue their natural foraging behavior. Sophin said there are very few completely free-range egg farms since a lot of land is required, it’s labor intensive and profit margins are low. Phoenix’s Egg Farm produces both conventional and organic eggs; currently about 50% each. The farm is certified organic by Oregon Tilth. Souriya said the only difference between conventional and organic eggs is the feed source; all chickens are free-range. Organic chicken feed costs about twice as much as conventional. In addition to chicken feed, hens are fed a mix of sunflower seeds, corn, and vegetables. The farms has partnered with other local farms to give their conventionally-fed hens pumpkins in the fall, and apples, plums, and other fruits in season. The Khamvongsas believe in ethical treatment of their animals. There are no antibiotics given or beak trimming performed, both common with large commercial egg farms. Their goal is to produce a healthful product for customers wanting a healthy lifestyle. Sophin said that customers with food allergies have told them their fresh eggs are more palatable. As the only local producer in the county, Phoenix delivers to retail outlets, with no eggs held for more than a day at the farm before delivery. Souriya said this contrasts with the industry standard which considers “fresh” to be 21 days or less. Sophin said consumer demand is strong for both their organic and conventional eggs, with organic eggs selling at a higher price point to reflect the higher feed costs. They have some flexibility to follow market demand, she said, since they can easily switch from organic to conventional by changing the feed source (but not vice versa). She said eggs are priced to economically sustain the operation, not to generate high profit margins. The eggs are now sold at seven local grocery stores. They are no longer sold at the roadside stand due to theft problems. Our local outlet is Plainview Grocery, where, Sophin said, the mark-up is lower than at other stores. Other retailers include New Seasons (Orenco Station and Beaverton), Whole Foods (Pearl District), Food Front Co-op, People’s Co-op and Urban Farm Store. With demand still exceeding supply, Sophin says, the Khamvongsas are considering expanding the chicken flock to 5,000 birds next year. Grocery stores want supply commitments that they cannot meet at current levels of production, she said. Meanwhile, the newest arrivals at Phoenix’s Egg Farm are a flock of 30 Kaki Campbell ducks. They are expected to begin laying in April. The fresh, free-range duck eggs will be sold at New Seasons and, depending on availability, Plainview Grocery. To see more information and photos about Phoenix’s Egg Farm, visit www.phoenixseggfarm.com.